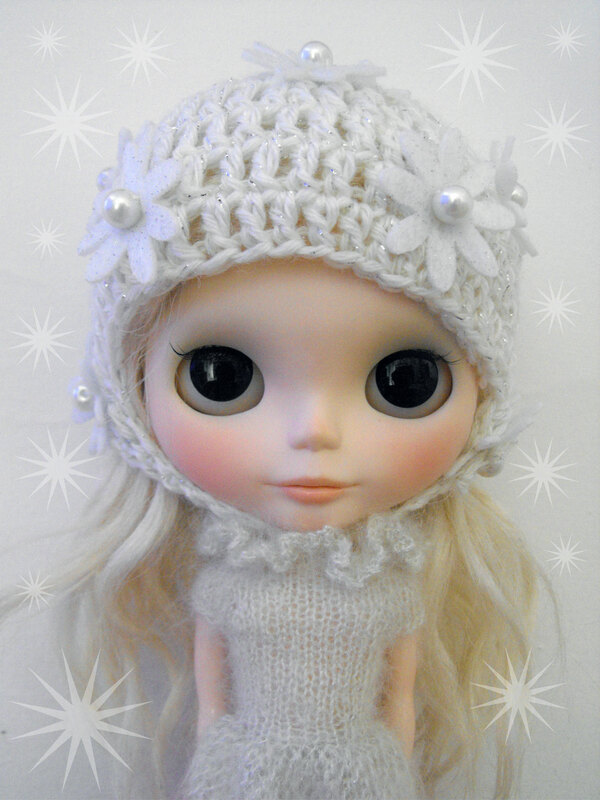 “Silver Peace” a collaboration set between BC and Blythe Princess Designs for a friend in need! Some time ago I was awared by Sarah/BlythePrincessDesigns that a girl in the Blythe community had to sell her dollies recently because a family member is very ill. Even if I don’t know her personally, she’s a good flickr friend and customer, so me and Sarah thought it would be a good idea to help her offering our work for an ebay auction. It was a perfect timing because that day I was so sad from some misunderstanding between myself and one of my commission list customers, so it was a good way to turn sadness into something good. It was wonderful to work along with Sarah, whose work I apreciate a lot! -An handknitted BC special Granny Hat in white/silver lurex yarn, white/silver glitter felt flowers and white pearlescent beads. it closes on the side with a special “created for you” silver charm (not shown in photos). -An handknitted romper for Blythe made in a mixed Kid Mohair/Silk/Lurex yarn, it closes at the back with a sewn on snap and has a wonderful ruffle on the collar. The romper it’s based on a pattern by Sherri Harrington (thank you Sherri!). Here’s the link to the three days ebay auction, please contact me for any question! what a wonderful thing to do. and this is a beautiful, STUNNING set! I look forward to seeing it being worn proudly by a lovely Blythe in our special, close knit community. Thank you so much girls, for sure it was a good cause!